About "Laws of Sine and Cosine Practical Problems"
Here we are going to see some practical problems using the concept of law of sines and cosines. 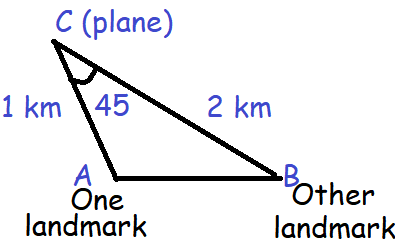 A plane is 1 km from one landmark and 2 km from another. From the planes point of view the land between them subtends an angle of 45°. How far apart are the landmarks? We have to find the length of AB. 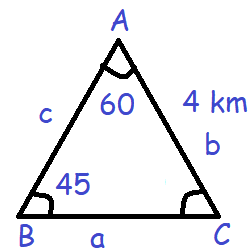 A man starts his morning walk at a point A reaches two points B and C and finally back to A such that ∠A = 60◦ and ∠B = 45◦, AC = 4 km in the triangle ABC. Find the total distance he covered during his morning walk. First let us find "a". By applying a = 2√6 in (1) and find c.
Two vehicles leave the same place P at the same time moving along two different roads. One vehicle moves at an average speed of 60 km/hr and the other vehicle moves at an average speed of 80 km/hr. After half an hour the vehicle reach the destinations A and B. 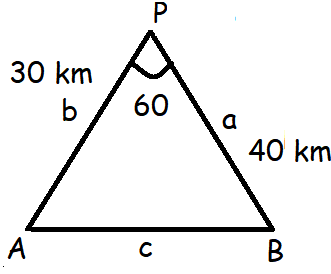 If AB subtends 60◦ at the initial point P, then find AB. Hence the distance of A and B is 10√13 km. Suppose that a satellite in space, an earth station and the centre of earth all lie in the same plane.Let r be the radius of earth and R be the distance from the centre of earth to the satellite. Let d be the distance from the earth station to the satellite. Let 30◦ be the angle of elevation from the earth station to the satellite. 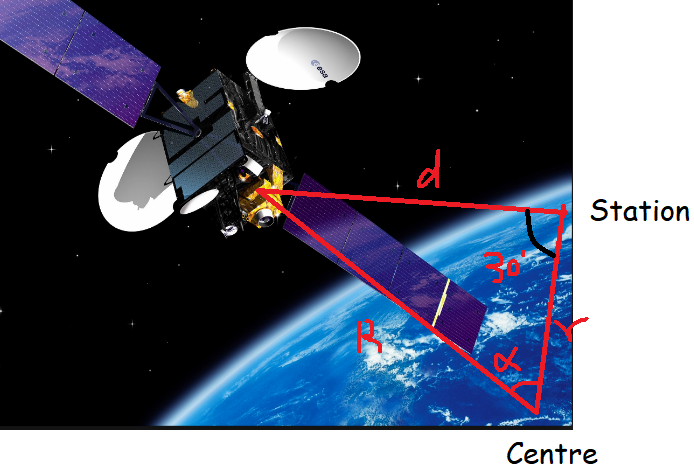 If the line segment connecting earth station and satellite subtends angle α at the centre of earth , then prove that d = R√1 + (r/R)2 − 2 (r/R) cos α. Let A be the centre, B be the station and C be the satellite position. After having gone through the stuff given above, we hope that the students would have understood, "Laws of Sine and Cosine Practical Problems"
Apart from the stuff given in "Laws of Sine and Cosine Practical Problems", if you need any other stuff in math, please use our google custom search here.